There are all kinds of shelving options for typical loads, but what do you do with the really heavy, dense, or bulky items that just won’t work on conventional shelving, but that aren’t loaded on a pallet rack? Or things that aren’t big enough to store on pallet racks, but don’t fit into standard shelving? That’s where wide span bulk shelving comes into play. It’s similar to pallet rack, but built for hand-loaded case or piece storage. Rather than using sheet steel to build out vertical supports and shelving (closed shelving), or vertical posts with interlocking shelf levels (open shelving), wide span bulk shelving is made up of frames and beams similar to pallet rack. 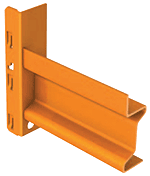 The wide span frame consists of two uprights, bracing and foot or base plates. Beams create the shelving levels with a front and rear beam for each level. Wire, steel or particle board decking provides the support surface that items are actually placed on. The decking is set into the space between the front and rear beams, resting on the beams’ retaining lip which actually supports and transfers the load’s weight to the uprights. Actual load capacity is dependent on the upright and beam sizes you select along with beam spacing, making it possible to build out wide span storage to fit specific load weights. For example, your beams may be able to support 1,764 lbs at 72″ wide but your total capacity is determined by how closely the beam levels are spaced. Say beams are spaced every 10″ on the uprights – your overall capacity is 9,570 lbs., but if beam spacing is increased to 70″ between levels total capacity drops to 5,072 pounds (based on Interlake-Mecalux Wide Span Shelving capacity chart). To increase capacity with wide span shelving, shorten the width between uprights. 48″ wide beams can bear up to 3,021 pounds, whereas 96″ wide beams only go up to 1,411 pounds (based on Interlake-Mecalux MS-U65 beam). Even with those considerations to keep in mind, per shelf level capacities are much higher than typical shelving. One of the great advantages of wide span shelving is that it fits well into a hand-loading environment where small amounts of a wide variety of products need to be readily available. That includes case or piece picking with light stock rotation. Wide span shelving is also perfect for storing high, wide, or bulky items – things like mechanical components, tires, cable rolls and more. 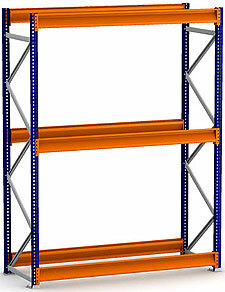 Wide span shelving is easy to install, can be reconfigured as needed, and is easy to move. It can also be installed in aisle configurations on mezzanines to save ground floor space. 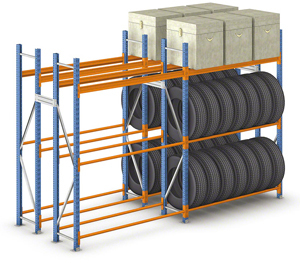 Highly flexible, great load capacity and service life – think of wide span shelving for bulky, large, medium to heavy loads that don’t require a forklift to load or unload.